You are here: Home / Mobile Bonuses / Parlay Bonuses / Soccer Betting Promotions / Specials Bonuses / Sportsbook Bonuses / Sportsbook Promotions / Bet on Football Transfer Specials at BetVictor Before the Summer Window Closes! 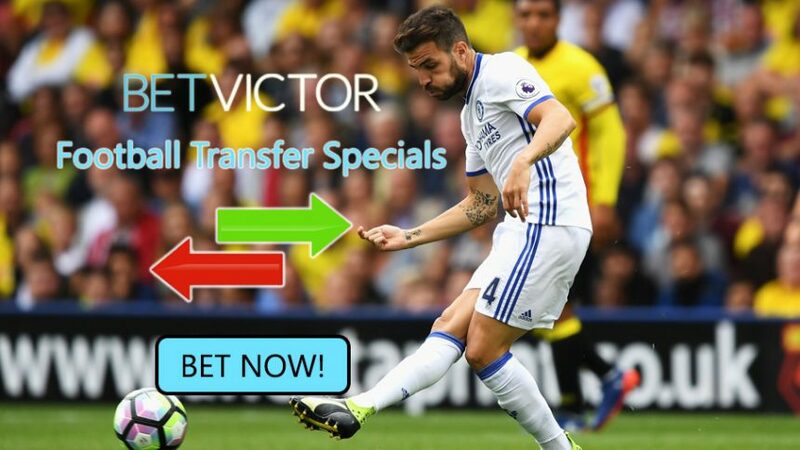 Bet on Football Transfer Specials at BetVictor Before the Summer Window Closes! Follow the latest transfer rumours that link top stars to the biggest European clubs and place a wager with BetVictor’s Football Transfer Specials! Lionel Messi has been heavily linked to the Premier League in recent seasons, after having won everything there is to win with Barcelona. The Argentine’s former boss Pep Guardiola has taken over Man City this summer, which is why they’re the favourites 6.00 (5/1) for his signature should he decide to take up the challenge of playing in England, per Football Transfer Specials. Arsenal are surprisingly second in the running 17.00 (16/1) for the 29-year-old forward, while Chelsea are third favourites 21.00 (20/1) – Stamford Bridge is home to two of Messi’s former teammates: Cesc Fabregas and Pedro Rodriguez. Football Transfer Specials also offer odds on Wayne Rooney making a switch to another club before the summer transfer window closes: Everton 7.00 (6/1), Any Chinese Club 9.00 (8/1), Any MLS Club 15.00 (14/1), PSG 17.00 (16/1), Chelsea 17.00 (16/1) and Arsenal 26.00 (25/1), among lots of others. The Gunners are the favourites to sign Liverpool striker Daniel Sturridge 6.00 (5/1), while a return to Stamford Bridge 13.00 (12/1) or even the Etihad remain open options 15.00 (14/1), per Football Transfer Specials. Chelsea have been touted as the top potential destination for both James Rodriguez 4.00 (3/1), Edinson Cavani 4.00 (3/1), Leonardo Bonucci 3.00 (2/1), Romelu Lukaku 2.25 (5/4) and also Arturo Vidal 9.00 (8/1). Former Man City striker Mario Balotelli has been frozen out by Liverpool boss Jurgen Klopp at Anfield and he is on the lookout for another club, with the Wolves being touted as the favourites to land his signature 2.37 (11/8). Serie A sides Bologna 5.00 (4/1) and Lazio 7.00 (6/1) are right behind them, while Aston Villa 13.00 (12/1) and Besiktas 17.00 (16/1) have also been linked with the 26-year-old. Football Transfer Specials are open until the end of the summer transfer window; it closes on September 1st. Place a bet on your favourite clubs and players before the transfer deadline day to capitalize on this great offer! The transfer deadline day is generally the busiest day of the summer for clubs looking to add a few more players to their squad; it allows them to seal last-minute deals before the transfer window closes for good. And with some Premier League sides underperforming at the moment (namely, Arsenal), we can expect to see some major singings coming over to England before/on September 1st! Open an account with BetVictor today and support your favourite side to sign their latest player with Football Transfer Specials! Bet on Football Transfer Specials!